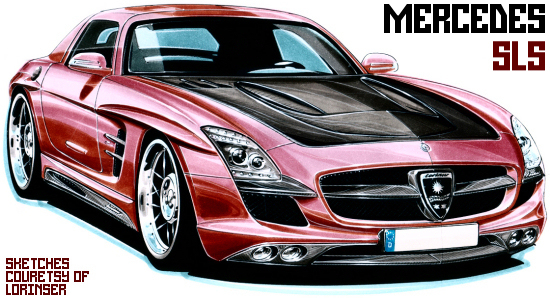 Mercedes tuning house Lorinser are currently thinking over what to do with the new SLS sports car. The super star of this year's IAA is created to pay tribute to the 1950's 300 SL and the stylists of Lorinser continue with this approach in two ways. One is a draft (image above) which refers to the roots of the original which was firstly designed for motorsports and focused on low weights. So Lorinser's homage features many carbon fibre parts, although this material had not been available then. But CEO Marcus Lorinser says: 'the lightweight concept of the 300 SL would definitely have contained this material'. Another interesting detail is the crest of the Lorinser family replacing the Mercedes star at the front grille. With the second version, the designers render homage to the legendary 300 SL as a sports road car. It even more refers to classic design cues. Such as the side gills. But, in fact it's just leaving out those details turning the first sketch into a racing car. An even more significant feature have both drafts common: the flarings, which were typical of the archetypes. 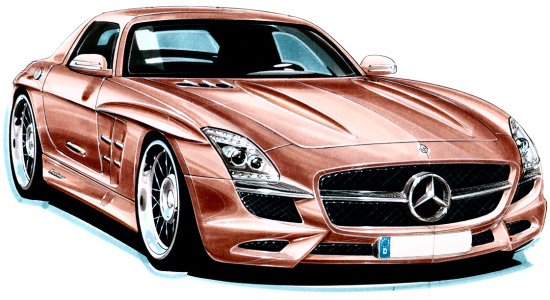 Thus the sketches are closer to the vehicle the new SLS is considered to pay tribute to.